California Challenges China In Rare Earths Mining China has cut its exports of rare earth minerals, used in cell phones, hybrid cars and computers. This has sent the price of rare earths soaring, making it profitable for the U.S. to compete with China in mining. A long-shuttered California mine has reopened and is expected to produce 40,000 tons of rare earths each year. 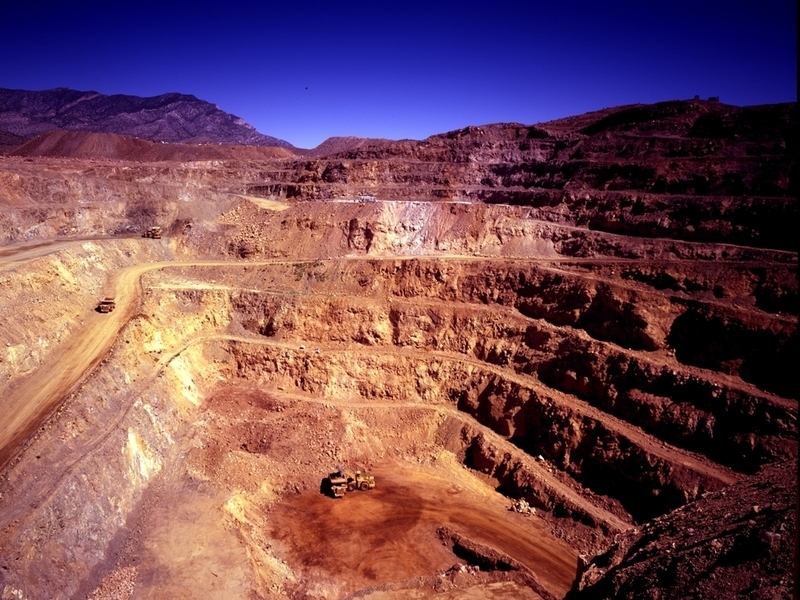 The open pit mine at Molycorp Minerals' rare earths mining and processing facility in Mountain Pass, Calif. The mine is expected to produce 40,000 tons of rare earth minerals each year after a $500 million expansion project. The minerals known as rare earths sound like something an alchemist would use to turn lead into gold. But the minerals are what make the modern world function. Rare earths are used in cell phones, hybrid cars, wind turbines and computers. China mines most of these minerals, but it's been cutting back on exports. This has caused the price of rare earths to soar, which has once again made it profitable to reopen a long-shuttered mine in California. Approaching the rim of the rare earths pit mine in the California desert, you expect to see something rare. But Scott Honin, the mine's environmental manager, points to a wall of rock as boringly brown as the vast desert around it. "Over the course of the next few weeks, we'll start mining the whole western wall of our open pit. And I, like a lot of my co-workers here, have been waiting for this for a long time," Honin says. The gap in terms of the world demand outside of what China has said they'll export is ... about 100,000 tons. Ed Richardson, vice president, Thomas & Skinner Inc. Nothing has been mined there for nearly a decade. The property known as Mountain Pass was owned by oil companies — most recently Chevron. But after 50 years of operation, it was no longer cost effective to compete with the Chinese. There were also permit problems and environmental issues. "It was probably a good thing that we were shut down," says Mark Smith, CEO of Molycorp Minerals, which bought the mine in 2008. Smith said it allowed them to re-evaluate the first 50 years of its operation. "Take a look at the strengths that we had, the weaknesses, try to re-strategize how we wanted to run this business and get it back on its feet," he said. Smith said the first thing they decided on was to run a cleaner operation. 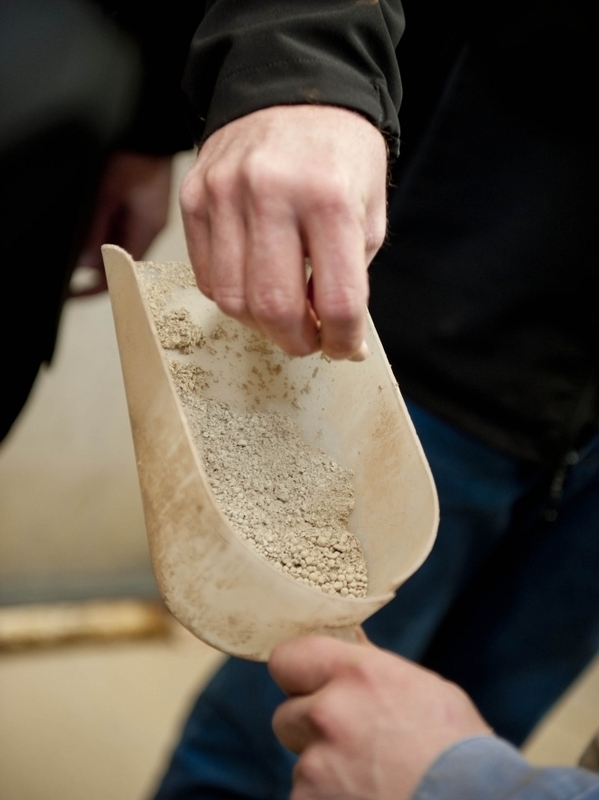 Mining rare earths is the easy part. The 17 elements that rare earths comprise are naturally found mixed together. And Smith says the usual method for separating the elements requires a witch's brew of chemicals: sulfuric acid, hydrochloric acid, nitric acid, sodium hydroxide, sodium bicarbonate and ammonia. The chemicals used to be trucked up to Mountain Pass in as many as 20 tankers a day, says Smith. The byproduct of the separation process was 850 gallons of saltwater a minute, which was piped into evaporation ponds. Now Molycorp has invented a method of taking that saltwater and reprocessing it back into the two main chemicals it uses to separate the rare earths. This will make the production cleaner and a lot cheaper. The operators at this plant are separating the elements neodymium and praseodymium from lanthanum and cerium. Honin said they're getting the kinks out of the new process while a new plant is being built. "So when we build the big plant we'll have an experienced group of operators and we'll have a really good understanding of the technology so that it will run very smoothly," Honin said. The 17 elements that rare earth minerals comprise are naturally mixed together in the rocks. Each element needs to be separated from the others. Molycorp plans to open the new plant in 2012. The company expects to produce as much as 40,000 tons a year. And that can't happen soon enough to suit Republican Rep. Mike Coffman of Colorado. Coffman is concerned about national security. He says rare earths are used in a lot of military equipment. "Everything from night vision goggles to fighter aircraft to precision-guided munitions," he says. So Coffman is drafting legislation that he says will support the mining, processing and stockpiling of rare earths in the U.S. "In case we have an extreme shortage of these metals to where we're not able to produce the kinds of weapons systems that we need for national security that are reliant upon these metals," Coffman said. Ed Richardson, vice president of Thomas & Skinner Inc., a company that makes magnets with military applications, has also pushed the government to stop depending on China for rare earths. He says the U.S. is in a global competition for rare earth minerals. "The gap in terms of the world demand outside of what China has said they'll export is about 100,000 tons," Richardson says. He said that as China's industry grows, its exports of rare earths will continue to shrink. "They're going to use all the rare earths they mine and then some," said Richardson. "So, many in the industry think that [China] will eventually not export at all, that they will eventually import rare earths." Meaning that one day China might not be Molycorp's competitor, but one of its customers.